In collaboration with Evan Carson (UNM), we are studying causes and consequences of hybridization in Cuatro Ciénegas pupfish. 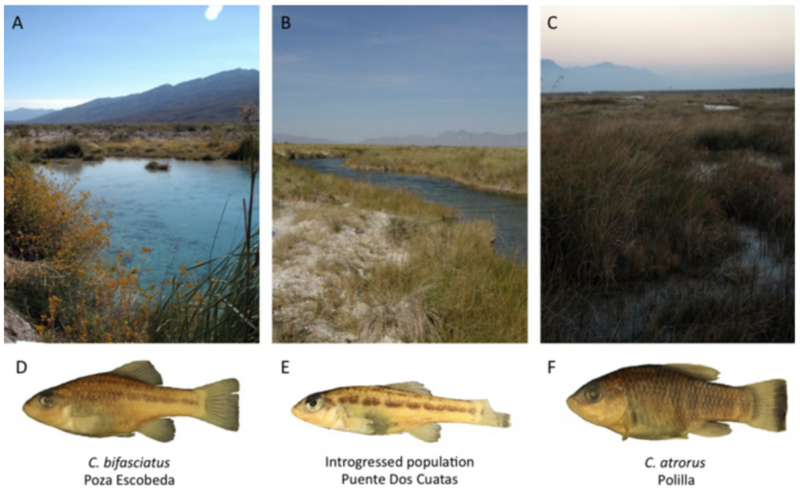 Two species of pupfish occur in this isolated desert valley in Mexico: Cyprinodon bifasciatus, which inhabits stable spring pools, and Cyprinodon atrorus, which inhabits terminal evaporative lagoons and marshes with highly variable environmental conditions. The two species hybridize extensively throughout the basin, and our research indicates that environmental conditions strongly predict both spatial and temporal patterns of hybridization. Hybrids occur particularly at sites with intermediate environmental conditions. Hybridization also affects phenotypic variation in pupfish through transgressive segregation, and hybrid morphology is not necessarily intermediate between parental species, but strongly correlated with local environmental conditions. Our current projects try to elucidate how hybridization affects adaptive trait divergence among pupfish populations, and how environmental variation allows for the persistence of parental and hybrid populations.